In 1992 ten fledgling designers were invited to design a trio of porter’s lodges for the Hoge Veluwe national park. The winning submission by MVRDV comprises three variations on the archetypal ‘hut’ in utterly distinct materials. It is a simple and recognizable basic idea applicable to any number of locations. 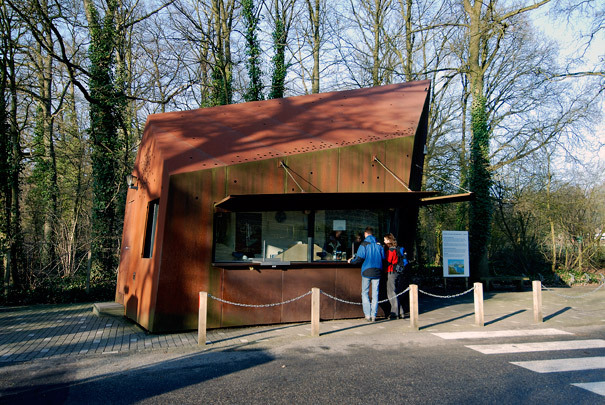 The one at Hoenderloo is entirely of Corten steel, that at Rijzenburg is in western red cedar and the Otterlo example is all brick. This unsettling material strategy of treating the facades and the roof as a single skin also informs MVRDV’s housing in Ypenburg.